Lucas began his career at Gremio in Brazil as a box to box midfield player and was immediately a huge success winning rave reviews, he was the youngest player to win the Bola de Oura (Golden Ball) awarded to the best player in the Campeonato Brasileiro, previously won by names such as Zico, Falcao, Romario, Kaka and Tevez. This early form won him many admirers across Europe with offers coming in from many top Spanish clubs and Inter for his services but it was Liverpool who won his signature signing him on 13th May 2007 for a transfer fee of six million pounds. Lucas made is debut for the club in November 2007 when the then manager Rafa Benitez gave him his opportunity, scoring his first goal on 27th January 2008, a fine curler into the top corner against Havant and Waterlooville in the FA Cup, making him the first Brazilian to score for Liverpool. 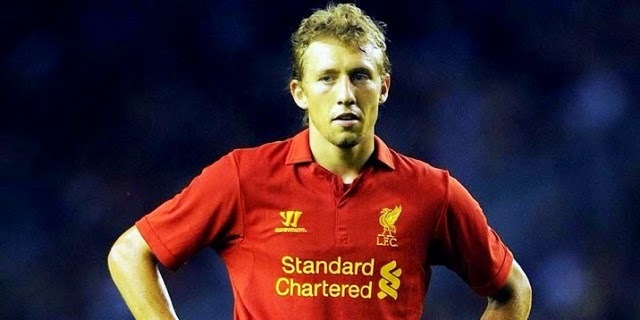 Initially Lucas struggled to force is way into the first team, he was competing against Mascherano, Alonso and Gerrard for a place in the "best midfield in the world" but was winning constant praise from his manager and colleagues with Benitez saying "people don't know just how good Lucas is" and when he did play he was always impressive with supporters and media singing his praises such as following the 5-1 win ver Newcastle United in December 2008 and the 4-1 win over Manchester United in March. By 2010 Lucas had forced his way into the team with some fine performances, his new standing at the club was underlined when he was made captain for a pre season friendly against Grasshopper and signing a new long term contract in March. By 2011 Lucas was one of the first names on the team sheet and was a vital cog in the Liverpool midfield, but unfortunately in December during a League Cup tie against Chelsea he suffered a serious injury when he damaged an anterior cruciate ligament in a challenge with Juan Mata, leaving him out of action for the rest of the season. Further injuries and lay offs on his return held him back further. On his long awaited return to the team many felt that Lucas has struggled to regain his pre injury form, lacking a yard of pace and not appearing to have the mobility of before and once again Lucas is struggling to regain a regular place in the starting team. Recently he has received criticism for his performances but i think that we need to remember that he has had terrible luck with injuries that appear to have taken the edge off his game, he was developing into a world class midfielder and he become a key player in our midfield, but he has been held back badly by terrible injuries. Lucas has been a good player for Liverpool but it is a case of what might have been.